On September 16, 1966, the Metropolitan Opera opened in its new home, part of Lincoln Center in New York City, New York. 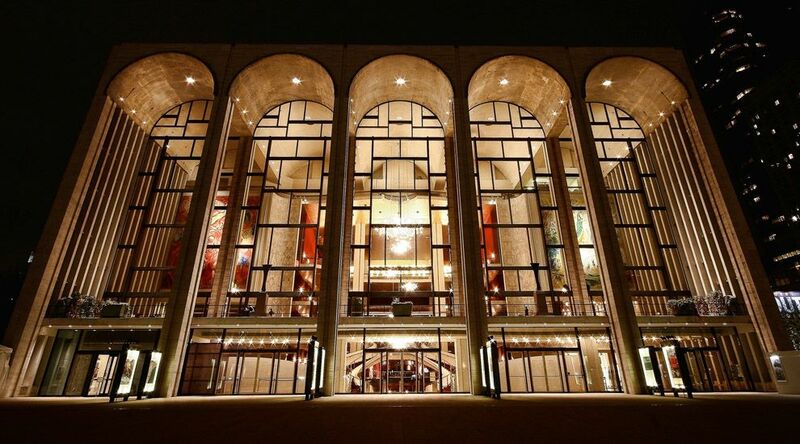 The gorgeous home of the Metropolitan Opera is part of the Lincoln Center arts complex in New York City, New York. The Metropolitan Opera House itself is home to two gorgeous paintings by Marc Chagall, created especially for the space and visible on the right and left in this photograph. Photograph by A. Strakey, courtesy Fotopedia. This file is licensed under the Creative Commons Attribution 2.0 Generic license. On September 16, 1966, the Metropolitan Opera opened in its new home, part of Lincoln Center in New York City, New York. Today, “the Met” is one of the most famous performance spaces in the world. Language is an important part of opera, and has been since the Met’s inception. When the organization was created in 1883, performances were entirely in Italian. Later, performances were entirely in German. Today, operas at the Met are usually performed in their original language—some in Italian, some in German, some in Russian, some in English, some in French . . . There are even “MetTitles” behind every seat in the theater, providing optional translations for most operas. The Metropolitan Opera House is home to more than opera. The venue has played host to ballet, classical music, comedy, and even the MTV Video Music Awards. type of formal dance with detailed, precise movements. formal Western European style of music, prolific in the sixteenth to eighteenth centuries. having to do with display of images that are more detailed than normal. having to do with a city or urban area. comic or dramatic play in which all roles are sung. up to a person's choice. entertaining act or presentation by a person or group of people. building or outdoor space for hosting performances. First Public Television Broadcast in U.S.